Now it's easy to see that the current flowing through a conductor or resistor (in amps) is equal to the potential difference across the object (in volts) divided by the resistance of the object (in ohms). If you want a large current to flow, you would require a large potential difference (such as a large battery), and/or a very small resistance. Question: The current in a wire is 24 amperes when connected to a 1.5 volt battery. Find the resistance of the wire. Question: In a simple electric circuit, a 24-ohm resistor is connected across a 6-volt battery. What is the current in the circuit? Note: Ohm's Law isn't truly a law of physics -- not all materials obey this relationship. It is, however, a very useful empirical relationship that accurately describes key electrical characteristics of conductors and resistors. One way to test if a material is ohmic (if it follows Ohm's Law) is to graph the voltage vs. current flow through the material. If the material obeys Ohm's Law, you'll get a linear relationship, and the slope of the line is equal to the material's resistance. Question: The graph below represents the relationship between the potential difference (V) across a resistor and the current (I) through the resistor. Through which entire interval does the resistor obey Ohm’s Law? 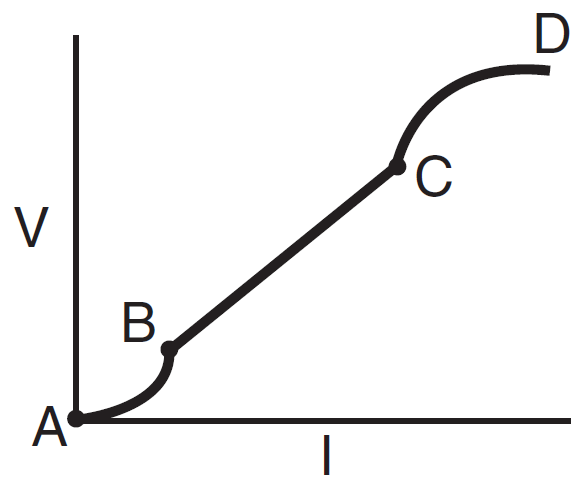 Answer: (2) BC because the graph is linear in this interval.